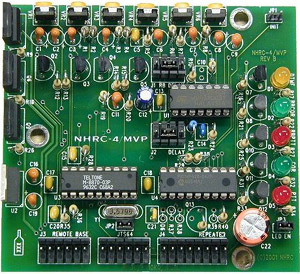 The NHRC-4/MVP is a specialized version of our NHRC-4 linking repeater controller, designed for installation inside a General Electric Custom MVP transceiver. The controller installs in place of of the GE channel-guard board. The controller has a "primary" and a "secondary" radio port. The primary port is used for the controlling repeater, and the secondary port can be used for a remote base, link radio, or "slaved" repeater. Unique courtesy tones provide feedback of the input source and link state. installed in a Custom MVP. Easily installs into a Custom MVP, producing a complete, compact repeater. Secondary port can be remote base, link radio or slaved duplex repeater. primary receiver courtesy tone, secondary port transmit enabled. secondary receiver courtesy tone, secondary port transmit enabled. primary receiver courtesy tone, secondary receiver active, alert mode selected. Fan control (runs when transmitter on and n minutes after). LED CAS, PTT, and DTMF indicators for primary port. CAS and PTT indicators for secondary port. Copyright © 2000-2017, NHRC LLC, all rights reserved.